ENDOR™ Rosacea package is the complete solution for the symptomatic relief of Rosacea, acne and pustules. For information regarding best results, please click here. ENDOR™ Rosacea package has been specifically designed to treat both red face rosacea and the associated bacterial and facial mites. ENDOR™ Rosacea Cream contains a number of antioxidants and vitamins as well as the precursors to an active compound (ENDOR Active), that signals the overactive immune response to return to normal levels. This overactive immune response is the underlying issue with red face rosacea. 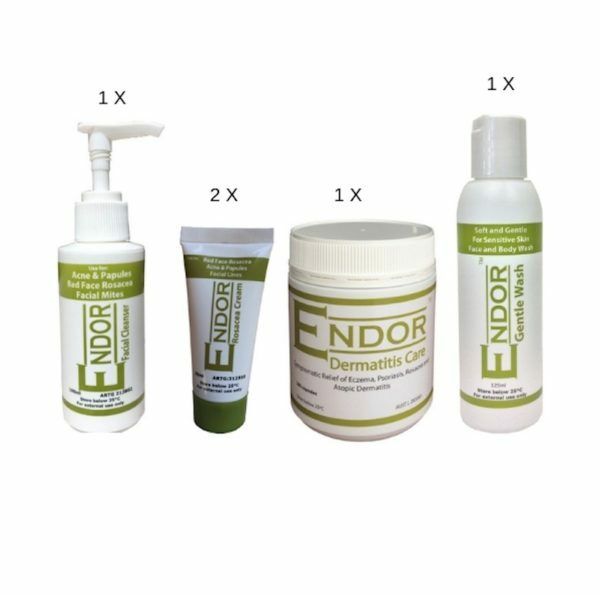 ENDOR™ Facial Cleanser contains natural cleansing and antibacterial as well as antiparasitic agents to treat any facial bacterial or parasitic infection causing acne and exacerbating rosacea. 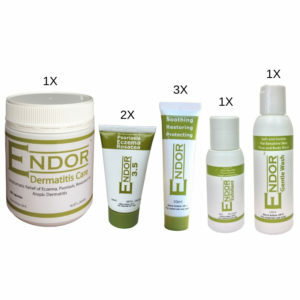 Use ENDOR™ Facal Cleanser at least once per day whilst treating your condition. ENDOR™ Gentle Wash is a face and body wash for sensitive skin, particularly for those suffering from rosacea and eczema. Use ENDOR™ Gentle Wash for everyday use. ENDOR Dermatitis Care capsules contain multivitamins as well as the precursors to the ENDOR active compound, which will signal the overactive immune response to return to normal levels. To read our FAQ about ENDOR™ Dermatitis Care, please click here. To read our FAQ about ENDOR™ Facial Cleanser, please click here. 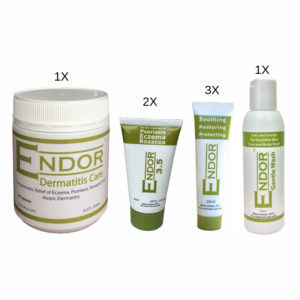 ENDOR™ Dermatitis Care: Betacarotene -2.5mg, Curcuma longa rhizome extract equiv. to dry- 1.25g, (Equiv. Curcumin- 23.75mg), Fish Oil – Rich in Omega 3 acids- 250mg, (Equiv. Docosahexaenoic acid [DHA]-30mg), ](Equiv. Eicosapentaenoic acid [EPA]- 45mg), (Equiv. Omega 3 marine triglycerides-75mg), Sodium ascorbate-56.8mg, (Equiv. Ascorbic acid [Vitamin C]-50mg ), Wheatgerm Oil – 75mg, Zinc Sulfate – 27.62mg, (Equiv. Zinc – 10mg). ENDOR™ Rosacea Cream: Aqua, Glycerin, Cetyl Stearyl Alcohol, Isopropyl myristate, Oleic Acid, Stearth-21, Sodium Citrate, Panthenol, Microcare, Vitamin E acetate, Vitamin C, Xiameter, Coconut oil, Dimethicone, Co Enzyme Q10, Lavender Oil, Tea Tree Oil, Hyaluronic Acid. ENDOR™ Facial Cleanser: Aqua, Canthick, Iselux, Sodium Hydroxide, Genagen, Microcare, Colamide, Gluco E20 Methyl Gkuceth 20, Aloe Vera Gel, Honey, Salicylic acid, Tea Tree Oil, Lavender Oil, Saliguard.